Tech Advance has been engaged in the application and development of functional films. Initially, Tech Advance processed and marketed them to the whole world. To meet all the customers' need, so far we produce Flexible Copper Claded Laminate (FCCL). We adopt advanced techniques from Japan and America, combining a series of practical technology which other successful FCCL companies developed. With these techniques and the advanced production equipment, we can produce a series of good quality products including Flexible CCL, Coverlay, Stiffener, Bonding sheet and so on. To upgrade the quality of our products, we invest a great sum of money on our Q. C. inspecting equipment. Under effective Q. C. control, our customer can place full reliance on our good-quality products. 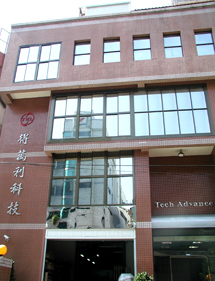 得萬利科技股份有限公司　TECH ADVANCE INDUSTRIAL CO.,LTD.